Started with a bang, and well, ended with it—the New York Fashion Week Autumn Winter 2019 was a descent success to say the least. Although underwhelming in some moments, it was a pragmatic upgrade that it was in dire need of since years. This year’s edition was less than a grand success, but more than a hit among the masses. Reason, you may ask? Well, when a lot had already been showed about street style and avant couture in the past years, this fashion week was more about conventional clothing that people can actually wear. Although edgy and upgraded, the week displayed a lot of consumer-friendly and practical fashion. From spunky formal silhouettes to subdued yet wild prints, here are some looks that I absolutely took away from the week! Bright but bearable yellows and pinks walked the ramp for Caroline Herrera, and the spectators were almost relived because these bright hues were tinted with crisp florals and came in voluminous shapes. Feminine in a chic and powerful way, I’m sure we’ll be seeing a lot of bright, shapeless dresses in our wardrobes soon. Elements picked from India’s artistry, his travels and experinces in Nepal and America, his collection was a hybrid of many cultures, and needless to say, it did leave a mark! From transitional deconstructed suits to funky hued, ethnic inspired prints, Gurung’s collection was a masterpiece as always. 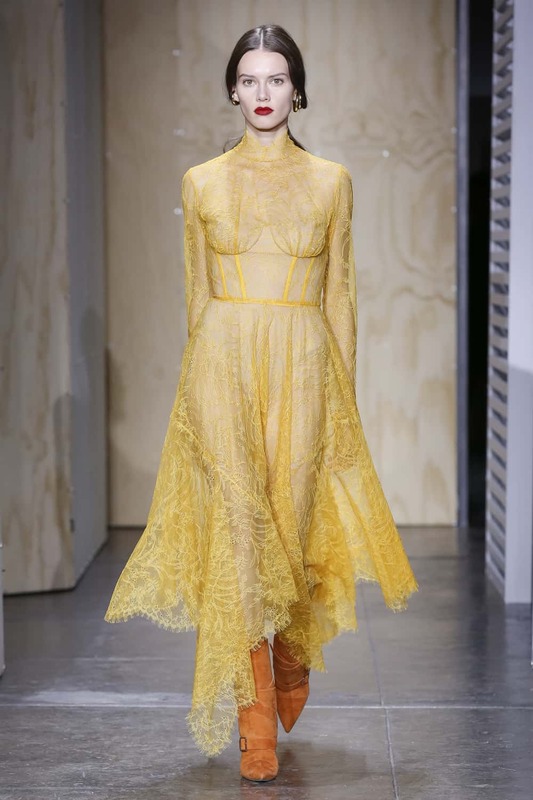 Celebrating femininity and Simkhai’s Ukrainian heritage fashion, the audience saw a lot of delicate slip dresses in shades of yellow, beautiful scarf dresses, and lace elements. Distinctively feminal and graceful in their textures and silhouettes, it is hard to keep these ensembles out of ones list of favourites. Although Hellessy at NYW AW19 was a lot more than just shimmer panstuits, those are what stood out the most for me. Deconstructed designs, colour-block suits, mismatched prints, and bold shimmer suits are what primarily marked Hellessy’s collection on the ramp. However, these strong-hued pantsuits struck a different cord with everyone as it did with me, I presume. More or less a newcomer, Khaite has held the fashion fans all over the world with confidence and a hint that they are here to stay. And surely, we wouldn’t mind that. With crisp fashion and elegance coming off through the designs, we are down for more of such. Bluffed sleeves, velvet pieces, classic plaids, and gowns that speak luxe have primarily been a part of Khaite’s fashion exhibition at the fashion week last month. While these elements touched my personal fashion instinct more than others, I also formed a strong connect with Kate Spade’s lilac toned look and Alexandra Wang’s slip dresses worn over boyfriend shirts. To conclude, bold, unafraid, experimental, and highly wearable are a few words that I believe would describe the New York fashion week best! The collections look lovely. The best part is that as you have mentioned many of the collections seem actually wearable by consumers, unlike in most fashion events. Loved the collection of Gurung, especially because of the intricate colours and designs. 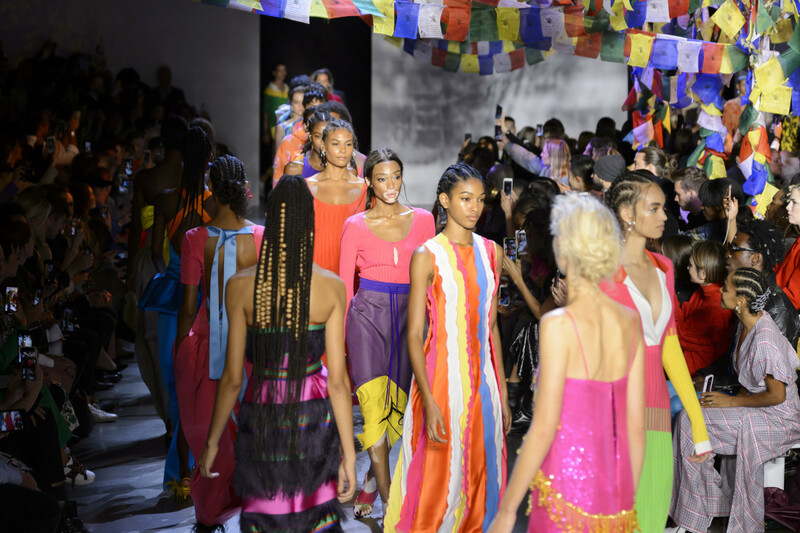 I like fashion that is wearable and comfortable and the bold shimmer suits from Hellessy’s collection and the bright hues by Caroline Herrera tick the right boxes for me.You have brought NYFW to us – Thanks ! A great summary of the fashion trends this season. I like all the designer wear shown here though not particularly impressed by Gurung’s. The mixing of solid colours from the colour wheel is not flattering to the woman’s silhouette. I’m in total love with Caroline Herrera and Khaite’s collection. looking forward to more posts. This is one beautifully written post. You have a knack for covering these events in a beautiful way. Thought I should tell you.